Everywhere But Home | News and musings from wherever my crazy life takes me. My body may be back in Illinois, but at least for now, my mind is still in Mongolia. Today is Halloween, which means that I’ve been back in the US for just over a year. You wouldn’t know it from this blog, since I’m still mostly writing about my experiences overseas; I can hardly believe it myself! But the dates don’t lie: a year ago today, I was just beginning to deal with the unexpected difficulties of reverse culture shock, and two years ago today, I was teaching Mongolian students and teachers alike about Halloween. By far the most popular activity of the day was an adaptation of a game I know as “The Winds Are Changing,” which I played with my teacher class. The players stand in a circle, with one in the center, and you mark the spaces in some way – with a playing card, or a pen, or something similar. When I played this at camp, we used it as a get-to-know-you game, and the person in the center had to say their name and something about themselves; on this day, I asked the person in the center to tell the rest of the class something they were scared of. Whether the information being shared is a fear, a fun fact, or an ice cream preference, all other players to whom the fact also applies must leave their spots and find another (one that isn’t adjacent to their own). Because there is one fewer space than there are people and the person in the center is trying to find one of them, there will be a great deal of hustle and bustle as everyone tries not to be left in the center. Before we began, I provided them with a number of options to choose from: things I thought might be common fears, like heights, public speaking, spiders, snakes, dogs, and cats. I had expected that my students would get a lot of practice saying, “I’m scared of spiders,” and “I’m afraid of cats,” but not much else; up to this point, they’d shown little to no interest in acquiring vocabulary beyond what I provided. Bad drivers – a legitimate fear in a country with such rudimentary roads and driving instruction! Midway through the class, we got an unexpected and unorthodox addition. My roommate, finding herself in the hot seat without a prepared statement, shouted, “I’m scared of Bayasmaa!” The room erupted in laughter, and everyone but Bayasmaa – the school’s physical education teacher, to whom I had assigned the dragon icon in my phone contacts list – scurried to change places. The best, though, came at the very end of the class period. One of the teachers clearly had something in mind, and when none of the others could translate it for her, she pulled out a dictionary and went hunting. At this point, only I was in the dark as to what she was trying to express, but I knew it had to be good from how anxiously all the other teachers were waiting. Finally, she grinned in triumph, set the dictionary down, and returned to her space in the center of the circle. “I’m scared of mother-in-law!” she crowed, and the room erupted in chaos as everyone, even the unmarried teachers, abandoned their spaces and caromed off each other in search of new ones. Some fears, I guess, are universal. Categories: Life in Mongolia | Tags: fears, Halloween, Mongolia, TEFL | Permalink. After all the difficulty in getting to Phitsanulok, I was in the city for a remarkably short time. 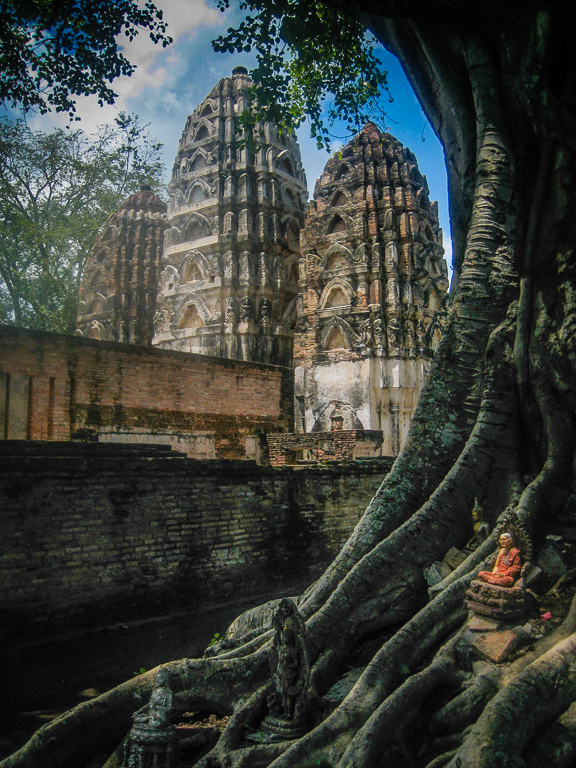 I’d planned on spending a day there before moving on to Sukhothai, but a closer look at the guidebook and the knowledge that I’d lost a day in Lopburi convinced me to skip it. So after a night in an unremarkable hotel, I bought a ticket for the first hour-long bus ride of the morning to Sukhothai. A kingdom in its own right 150 years before Ayutthaya rose to prominence and a modern UNESCO World Heritage Site, Sukhothai had been on my must-see list from the get-go. Thai children are taught that this is where King Ramkhamhaeng invented the Thai script, though the archaeological record apparently casts some doubt upon this story. Still, I wasn’t about to question the history books (aloud, anyway) in a country where lèse majesté is still an imprisonable offense, and as we’ve established, I’m a sucker for palace and temple ruins. 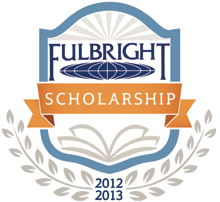 Sukhothai promised both, and plenty of them. I even found myself a couple of travel companions with whom to visit them. There were two guys in their twenties on the same bus—one from America, the other from France. We introduced ourselves while waiting for the bus and told stories about the other places we’d traveled during the ride. By the time we reached our destination, we’d decided to stick together for the next day or two. After pooling our resources to “splurge” on an air-conditioned room in a lovely little guesthouse, we took advantage of the free bikes to explore the town. 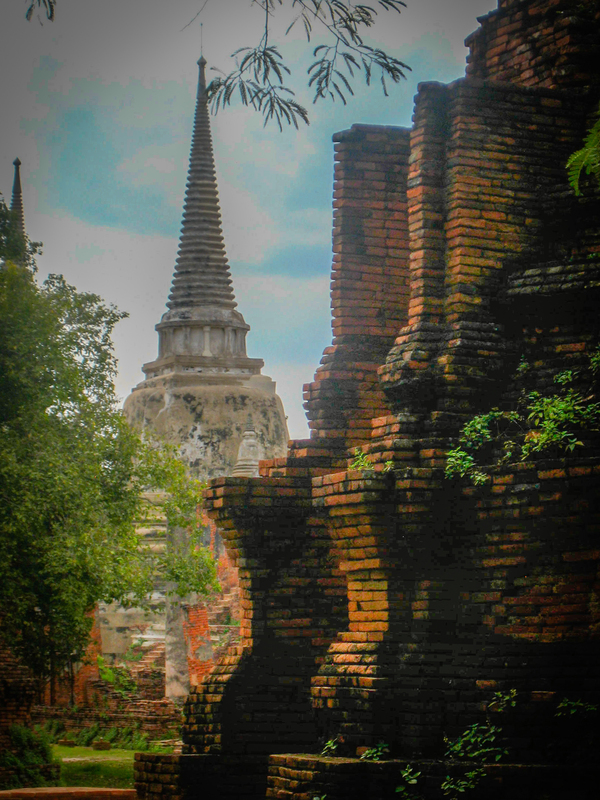 Lacking the river boundaries, Sukhothai has spread quite a bit more than Ayutthaya in the past 700 years. Instead of residing atop its past, New Sukhothai is distinct from Old Sukhothai, and the latter is contained within a historical park. Since we’d already lost most of the morning, we decided to postpone our visit until the next day and made a haphazard circuit of the city, eventually working our way over to the impressive Phra Mae Ya Shrine. It houses an idol dedicated by King Ramkhamhaeng to his mother—and, according to local belief, the spirit of the great king himself. As was so often the case in Thailand, the shrine proved too large for me to get a good picture of the whole structure; if I managed to get all five of the towers into the shot, it also included undesirable items like street lights. Happily, our visit to the historical park the next day gave me much more camera fodder! Wat Mathathat is the largest and most important set of ruins, and also the closest to the park entrance. This “temple of the great relic” was great indeed: the intervening centuries have stripped away the gilt and glitz the buildings must have had when first built, but their scale and grandeur remain undiminished. Thai temples make tourists look tiny! Large and imposing as this complex was, however, it was only the beginning of what the park had to offer. While the boys and I opted not to pay the admission fees for any but the central zone, we did rent bikes in order to visit as much of that zone as possible. Sometimes, this meant a long trek around large moats that afforded a spectacular view, while at others, we crossed smaller moats to more intimate-feeling temples like the lovely Wat Sa Si. What I really appreciated as I wandered through the park was the complexity of the structures it contained and the emotions they evoked. While I wasn’t sufficiently versed in Thai architectural history to know from the shape of a chedi the era in which it was built, even I could see from the many subtle variations in design that they bore witness to the preferences of different time periods and ruling peoples. Nor did I have to know whether a chedi was Lanna, Lanka, etc. to appreciate its many facets. Even the most massive temples boasted intricate adornments not yet lost to the erosion of time. Recent visitors had also added to these monuments in unexpected ways: not with the offerings I’d grown used to seeing in Mongolia, but with little Buddha figurines tucked into unexpected corners. Just as in the majestic cathedrals of Europe, I found myself in a contemplative state of mind while wandering the park. Even teeming with noisy tourists, there was something meditative about these spaces. You can only witness the silent, stone serenity of so many seated Buddhas before you either grow twitchy with boredom or fall under the spell yourself. And in a place this gorgeous, who could ever be bored? Many thanks to my mother for post-processing and color correction on all photos in this post! 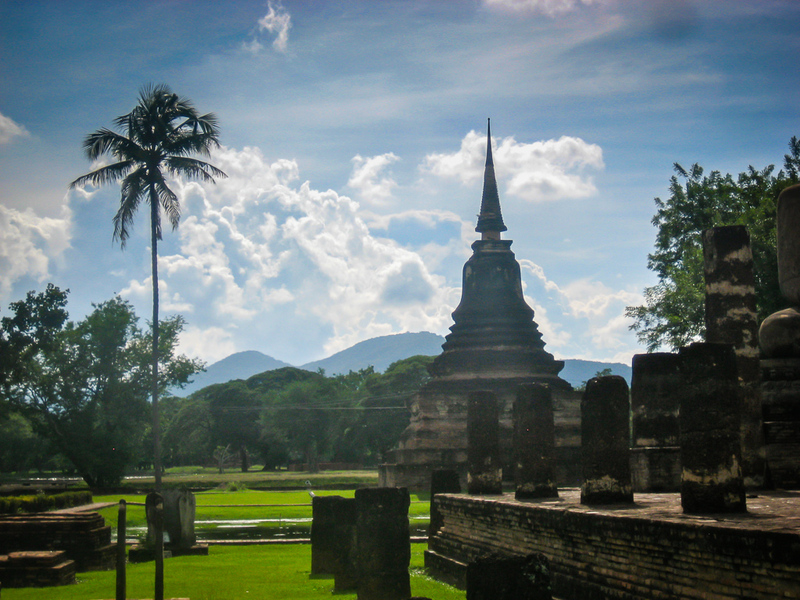 Categories: Travel | Tags: pretty pictures, sightseeing, Sukhothai, Thailand | Permalink. This is Part IV of my Thailand Tuesdays series. If you’ve missed them, please check out the Introduction, Part I, Part II, and Part III. There’s nothing quite like waking up to an unidentifiable sound in a place you hadn’t expected to be. I grew up in midwestern America, where rooftop rustling is common heard and easy explained. The vast majority of the time, that scratching sound your window or above your head is the scrabbling of a squirrel–if you’re very unlucky, a raccoon. But after a year in Mongolia, I’d grown unaccustomed to the sound. I quickly placed my location, my bandaged hand reminding me how I’d landed in a hotel in Lopburi, but the noise still perplexed me. Please do not open the windows, or monkeys may steal your belongings. I hadn’t done any research on Lopburi prior to arriving, and it wasn’t in my northern-focused guidebook, so I took to the internet. Lopburi, it turns out, is the kind of city where WikiTravel’s Sleep section is divided into two categories: “Places with lots of monkeys” and “Places with few monkeys.” The better hotels in Old Town, which plays host to most of the monkeys, are enclosed by cages that keep them at bay, allowing the guests to open their windows. Clearly, mine was not one of these. After acquiring a map of the city, I purchased a ticket to a fenced-off brick ruin and found it to house hundreds of the things. An older Thai gentleman approached me once I entered the compound and offered to sell me a plastic bag of corn, saying that feeding the monkeys would keep them from biting. I declined, envisioning myself besieged by hungry, demanding simians. My fears proved well-founded: the next pair of tourists to enter the gate found themselves swarmed. The monkey sitting at your feet, reaching inquisitive fingers up to take a piece of corn from your hand, is cute; the one that climbs atop your backpack and refuses to be dislodged, not so much. The ones that jump you from behind when you try to back away, grabbing hold of your jeans and swinging themselves up towards your face, are downright terrifying. I came to the couple’s aid, swatting at the monkeys with my map and my water bottle, and we all beat a hasty retreat to the street. Even there, we weren’t entirely safe. The fence was there to keep the tourists out; it did nothing whatsoever for the monkeys. They were everywhere in this part of the town: roaming the streets, lazing on the sidewalks, walking the power lines, even invading some of the ground-floor stores. I snapped a few pictures of the admittedly adorable babies but quickly discovered what the locals already know: they are clever, mischievous pests, made all the more pestilential by their intelligence and opposable thumbs. What I really wanted was a monkey stick, one of those long bamboo rods the shopkeepers used to to keep the macaques at bay without coming in range of their teeth. Lacking such a device, I tread amongst them with care. Never have I been so aware of my lack of a rabies vaccination as I was as I made my slow way through the monkey gauntlet, doing my utmost not step on anyone’s tail. In all respects but one, though, I made my way through the city without incident. My bandaged hand drew a lot of attention throughout the day, and I found myself continually having to explain that it was not (thankfully!) from a monkey bite. The nurses at the clinic I visited in the afternoon were among those who asked the question. I’d been instructed to have the bandages on my hand rewrapped every day, and while that seemed like overkill, the sheer difficulty of keeping the gauze clean and neat convinced me to have it done at least on that first day. Of course, it was after paying to have my hand rewrapped that I tripped on a curb and instinctively put out my hands to break my fall. Not a good instinct: the impact pulled at my stitches and, I could have sworn, every nerve ending in that hand. I had not cried once the previous evening, but at the blinding flash of agony that seared through my hand when it hit the ground, I sank to the curb and sobbed as the reopened wound quickly bled through my freshly wrapped bandages. When I reappeared at the clinic, tearstained and bloody, less than an hour after I’d left it, the nurse took pity on me and patched my hand up for free. After both flows had ebbed, I thanked her and resumed my explorations. 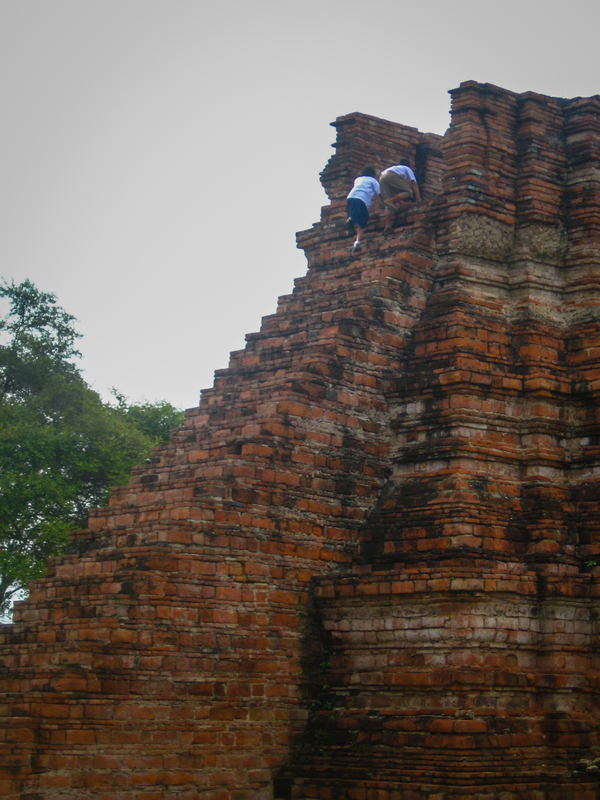 Lopburi’s ruins were as plentiful as Ayutthaya’s, and often easier to access. Again and again, I found myself awed by the scale and intricacy of these ancient temples, not to mention the fact that I was actually allowed to enter them. I’m a total sucker for interesting places to sit and write, so I broke out my journal for a peaceful half an hour at one of the temples. With so many sites to see, it was hard to rationalize staying any longer, but if I had access to these kinds of ruins on a daily basis, I’m sure I’d visit regularly to write. How can you not be inspired by the majesty of an ancient yet still-standing chedi, or the mystery of a gallery of headless Buddha figures? As the afternoon waned, however, my tour of Lopburi was cut short. I had intended to head across the tracks to the eat side of town, which I’d neglected in my wanderings, while I waited for my train to Phitsanulok, but a look at the skies was all it took me to scrap those plans. The clouds overhead meant business, reminding me that it was, after all, the rainy season. When the women at the night market stands started battening down the hatches against the strengthening wind, I decided that sticking close to the train station might be prudent. The rain, when it came, was sudden and intense; not the most drenching downpour I’d seen that summer, but not one I’d want to face unprotected either. I took shelter under streetside awnings along with others caught in the deluge, slowly working my way as close to the train station as I could without getting completely soaked. Thankfully, it soon subsided to a gentle drizzle I was happy to brave, and a breeze and welcome cool followed in its wake. Sitting on the platform to finish recording the day’s experiences, I was comfortable outdoors for for the first time since arriving in Thailand. 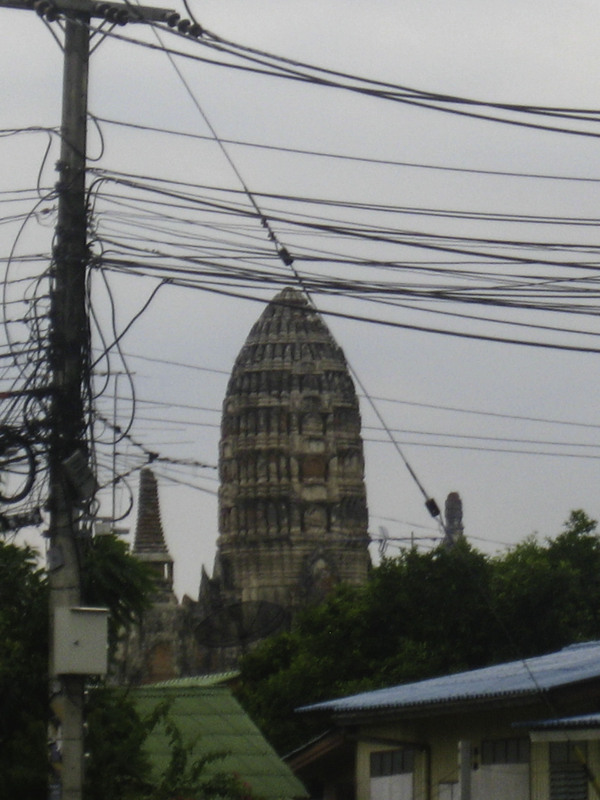 Categories: Travel | Tags: Lopburi, misadventures, monkeys, sightseeing, Thailand | Permalink.